While college attendance rates have risen dramatically over the past four decades, college completion has not kept pace. For example, while the percentage of 23-year olds with some college experience increased by 31 percent between 1971 and 1999, degree completion by this age increased by only 4 percent (Turner 2004). Part of this decline is due to students taking more time to complete degrees (e.g. Turner 2004, Dynarski and Deming 2008), yet whereas the U.S. previously led the world in the percentage of the population having bachelor’s degrees, it has now lost that leadership. Over the last three decades, cohort-based completion rates have increased by 2-3 percentage points across cohorts in the US while other OECD countries such as the UK and France have seen 10-15 percentage point increases in completion rates (OECD 2007). These concerns about educational attainment have led to increased scrutiny of college completion and movements to hold universities accountable for graduation rates. Foundations and policymakers have increased their focus on improving persistence and graduation rates. For example, President Obama’s 2009, 2010 and 2011 State of the Union addresses have all touched on college completion, most notably in 2009 when he said, “This country needs and values the talents of every American. That is why we will provide the support necessary for you to complete college and meet a new goal: by 2020, America will once again have the highest proportion of college graduates in the world” (Obama, 2009). This focus on completion rates is not new; universities have long been concerned with low completion rates and have actively searched for strategies to increase college persistence and completion. One such effort which is the focus of our paper has been the use of mentors and coaches to facilitate student persistence and completion. The use of college counselors is a well established practice in higher education. Work by Tinto (1975, 1998) on the social and academic factors leading to dropout and recent studies (e.g. Goldrick-Rab 2010, Bettinger, Long, Oreopoulos, and Sanbonmatsu 2010) highlight how personalized support and advising might bridge students’ informational gaps and help students complete tasks they might not otherwise complete. Our paper focuses on coaching, a form of college mentoring. InsideTrack is an independent provider of coaching services that incorporates a combination of methodologies, curricula, and technologies. InsideTrack matches students to potential coaches, and these coaches regularly contact their students to provide help and support as they are starting a semester of study and as they continue through their first year in school. In coaches’ interactions with students, they work to help students prioritize their studies, plan how they can be successful, and identify and overcome barriers to students’ academic success. Specifically, the coaches focus significant time assessing the student’s life outside of school, which InsideTrack has found to be the leading influencer on student persistence and completion. Topics such as personal time commitments (work scheduling), primary care-giving responsibilities, and financial obligations are common during a student-coach interaction. Over the past decade, InsideTrack has provided student coaching at a variety of public, private, and proprietary colleges. The company’s model focuses on partnering with universities to deliver its mentoring program. Inside Track provides required people, processes and technologies. The economies of scale the company realizes from serving multiple institutions enables it to make investments that are typically out of reach for individual colleges and universities. We find that retention and completion rates were greater in the coached group. This held true for every length of time following enrollment. After six months, students in the coached group were 5.2 percentage points more likely to still be enrolled than students in the non-coached group (63.2 percent vs. 58.0 percent). At the end of 12 months, the effect was 5.3 percentage points. The effects persisted for at least one more year after the coaching had concluded. After 18 months, there was a 4.3 percentage point increase in college retention and after 24 months, there was still a 3.4 percentage point treatment effect from the coaching. These differences are all statistically significant over a 99 percent confidence interval. Moreover, these results do not change when we control for age, gender, ACT score, high school GPA, SAT score, on- or off-campus residence, receipt of a merit scholarship, Pell Grant awards, math and English remediation. For three cohorts for which we have degree completion data, we find that graduation rates increased by four percentage points. All of these estimated effects represent the intention to treat, and given that not all students selected for the treatment actually participated in the treatment, estimates of the effect of the treatment on the treated are likely much higher. 1 InsideTrack worked with more than just these 17 cohorts during these two years. The 17 cohorts represent all of the cases where lotteries were used in these two years. The research team selected the two years used in the research. We chose the 2004 cohorts so that we could make some comparisons to the 2003/2004 Beginning Postsecondary Study. We chose the 2007 cohorts as they are the most recent cohort for whom we observe 24-month retention rates. 2 InsideTrack also worked with additional cohorts in the two years upon which we focus. In these other cohorts, the universities or colleges wanted InsideTrack to serve all students at their campus rather than a subset. In order to identify the effects of the program, we focus on the 17 cohorts where lotteries were used. College retention has long been the focus of research in sociology, education, and economics, and the relationship between student and institutional characteristics and college graduation rates has been a frequent topic in the academic literature (e.g. Tinto 1975, 1998; Gansemer-Topf and Schuh 2006 ). The academic literature has identified several barriers which could potentially reduce graduation rates. For example, one direction of research has largely focused on financial barriers and liquidity constraints (e.g. Dynarski and Deming 2010, Belley and Lochner 2008) or students’ incentives (e.g. Angrist, Lang, and Oreopoulos 2006). These studies often focus on identifying the effects of additional financial aid on students’ persistence and graduation (e.g. Dynarski 2010, Bettinger 2004). There are other lines of research which are germane to our study of college mentorship. College mentorship has elements of academic preparation, information gathering, and social integration. For example, one of the goals of a college mentor is to help a student academically prepare for their courses. Academic preparation has long been acknowledged as a contributing factor to college retention (e.g. Adelman & Gonzalez 2006). Studies of college remediation (e.g. Calcagno and Long 2008, Bettinger and Long 2008) have attempted to identify whether academic remediation can improve students’ college outcomes. In college mentoring, the mentors often counsel students both on how to acquire better study skills and on how to identify additional academic resources at their respective institutions. Another related line of study comes from the emerging research in behavioral economics. Recent studies have focused on the complexity of processes that students face and the information upon which they make decisions (e.g. Bettinger, Long, Oreopoulos, and Sanbanmatsu 2010). Students often need a “nudge” (Thaler 2008) to complete complex tasks. In higher education, it is often assumed that course requirements provide that nudge or that students are sufficiently self-motivated to not need external stimuli. College graduation rates show that that assumption might not be true; student coaching might be a mechanism to “nudge” students. One of the goals of student coaching is to motivate the students to complete tasks. A final set of related research focuses on students’ feelings of separation and exclusion and how perceived separation might contribute to drop-out rates. Tinto (1975) articulated a theory of retention which suggests that feelings of separation lead to students dropping out. Researchers have attempted to identify ways to decrease students’ feelings of separation (e.g. Bloom and Sommo 2005). Student coaching may be a way for universities to reach out to students who may not otherwise be connected to their respective institutions. There are a number of related interventions which attempt to influence students in multiple dimensions. For example, Bloom and Sommo (2005) examined learning communities. Learning communities enroll a cohort of undergraduate students in a common set of courses and often have these students reside near each other. The idea is to create a “community” where the students will not feel isolated. While the communities in this study led to improved academic performance, they did not increase college persistence. Scrivener et al’s 2008 study of a freshman learning community found that students randomly assigned to the treatment group moved through remedial courses more quickly, took and passed more courses and earned more credits in their first semester than students in the control group. Two years later, they were also more likely to be enrolled in college. Other interventions have focused on improving the efficacy of students’ academic habits, time management and study skills. For example, Zeidenberg, Jenkins and Calcagno (2007) found that enrollment in a student success course (classes that focus on time management, note taking, learning styles and long term planning) at Florida community colleges corresponded to an increase in persistence rates of eight percentage points. Other studies (e.g. Kern, Fagley, & Miller 1998; Robbins et al 2004) that has shown a positive link between productive study habits and cumulative GPA and college persistence. In recent years, several educational interventions have attempted to use college counseling as a means for improving college outcomes. However, treatments identified as “counseling” or “advising” vary greatly- some are strictly academic, others focus on study skills and social needs. Some treatments employ school personnel while others test the efficacy of utilizing third party providers. The need for student support in college has been well documented. Research has found that many community college students have little knowledge of course requirements and are unsure if their courses will meet requirement needs (Goldrick-Rab, 2010). Deil-Amen and Rosenbaum (2003) note that such structured advising is advantageous to students with less social know-how (first generation college students and those from lower socio-economic backgrounds). They find that such students often do not know that they need help, don’t take the initiative to seek it out or don’t know what questions to ask. Additionally, traditional college counseling programs are unable to provide support for all students. A study of counselors at community colleges conducted by the American College Counseling Association found that counselors report high student-to-counselor ratios. Fifty-five percent of schools have counselor to student ratios between 1 per 1500 and 1 per 3500 (Gallagher 2010). The literature on the effects of college advising on retention is growing. A few rigorous studies have recently been conducted. One study (Scrivener & Weiss 2009) studied the effect of enhanced counseling at two community colleges in Ohio. They found that students randomly assigned to an intervention consisting of increased counseling (meeting with a program counselor twice a term for two terms) and a small stipend (to incentivize students’ attendance in this more frequent, intensive advising) registered for classes at a higher rate than did students in the control group. The effects dissipated after the intervention had ended. Brock and Richburg-Hayes (2006) investigation of the Opening Doors Scholarship program in Louisiana tested the effects of financial incentives and individual college counseling. Students could receive as much as $1000 per semester for their academic performance. College counselors followed up with students and reminded them of the incentive. Opening Doors students signed up for more credits than those in the treatment group, they were more successful in passing courses and they persisted in school in greater numbers. Angrist, Lang and Oreopoulos (2009) examined the effects of financial incentives and support services on academic achievement and persistence. Students were randomized into three treatment groups and a control group. The first treatment group was offered a range of support services including access to mentoring by older students and additional academic support. The second group was eligible to receive a substantial financial fellowship. The third treatment group was offered a combination of services and financial incentives. The authors found that students who were in the group receiving the combination of financial incentives and support services benefited the most. That group earned more credits, had higher GPAs and had lower levels of academic probation over the course of the year. The effect on grades persisted into the second year, after the program had finished. There was no impact on grades found for the services only group and the students who received the fellowship only showed a small increase in grades. 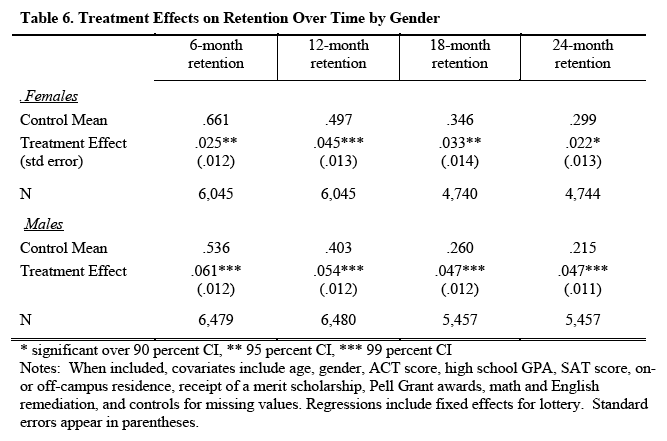 Importantly, these results were driven only by significant effects on female students; male students showed no increases in retention or academic success. These previous studies provide a rich context for the current investigation. While these studies parallel this study in important ways, most of the prior rigorous research on the effects of college counseling has included other factors, most notably financial incentives. While these studies suggest that advising can be an effective strategy for improving college success, the effect of trained one-on-one counselors on retention has not been studied by itself. The motivating principle at InsideTrack is that student coaching in a student’s educational career can lead to engagement, learning, retention and an increased probability of completing a degree. InsideTrack began offering services in the 2000-2001 school year and has coached more than 250,000 students nationally. The company first tested its coaching program by offering “free academic strategy sessions” to students at Stanford and UC Berkeley. Building on the success of these initial coaching curricula, the company partnered with universities to provide coaching to their incoming students. InsideTrack is now the largest provider of student coaching in the country, employing hundreds of coaches who work with thousands of students nationwide. As part of InsideTrack’s services, InsideTrack wanted to demonstrate its success to its partner universities. The universities gave a list of potential students to InsideTrack. Each school determined the criteria for inclusion and the size of the sample and selected students according to their own priorities. While most schools assigned a representative sample of new entrants, there was some heterogeneity in the assignment systems. Some schools focused on full-time students; others assigned part-time students. Some assigned upperclassmen; others assigned new entrants. One school assigned athletes. To demonstrate the effectiveness of its program, InsideTrack randomly divided the students into two groups while monitoring the randomization to make sure that the two groups were balanced across observable characteristics. After balancing the groups, InsideTrack allowed its partner organization to choose which of the two groups would receive counseling and coaching services3. These groupings allowed universities to monitor and to evaluate ex-post the efficacy of InsideTrack. Students were then randomly assigned by InsideTrack to a “coach.” The coach presented him or herself as a representative of both InsideTrack and the partner institution. InsideTrack carefully selected these coaches and trained them to work with students in identifying strategies for success. The coaches call their students regularly and in some cases have access to course syllabi, transcripts, and additional information on students’ performance and participation in specific courses. InsideTrack uses this additional information in a set of predictive algorithms that assess each student’s daily status for the purpose of reaching out to them on the right issues at the right times. Because of this background knowledge, conversations between coaches and students are both individualized and focused on success in school. Coaches generally work with students over two semesters although some students were part-time students enrolled in a single course. Students have the option to participate or not when contacted by the coach. Coaches contact students via phone, email, text messages and social networking sites. All of the students, regardless of whether they opted to participate in the coaching, are included in our analysis. The goal of the college coach was to encourage persistence and completion by helping students find ways to overcome both academic and “real-life” barriers and to identify strategies for success. Because InsideTrack has worked with a variety of private, public, and proprietary institutions, lessons from InsideTrack may be more generalizable than studies of a particular institution. 3 In some cases, the partner organization wanted a smaller control group. In these cases, InsideTrack showed the balance of the two groups and had the respective institutions certify that they were balanced. To evaluate InsideTrack’s program, we requested the academic records for all of the students who were invited to work with InsideTrack during the 2003-2004 and 2007-2008 school years. During those two years, InsideTrack measured the performance of 13,555 students across eight different higher education institutions, including two- and four-year schools and public, private not-for-profit, and proprietary colleges.4 The students were randomly assigned in 17 lotteries – five occurring in the 2003-2004 school year and 12 in the 2007-2008 school year. Across these 17 cohorts, Inside Track randomly assigned 8,049 to receive services. 4 To protect the respective institutions and their strategies for retention and recruitment, Inside Track did not reveal the names of these colleges to the research team. The other 5,506 did not receive InsideTrack coaching services. All other services to the students (i.e. support from academic counselors, access to tutoring on campus) remained the same for both groups of students. In Table 1, we report basic descriptive statistics for the control group and the differences (with their standard errors) for the treatment group. In terms of descriptive characteristics, the profile of students is weighted more toward non-traditional college students. For example, the average age of students is about 31. Only about 25 percent of students are under the age of 23. Unlike higher education throughout the United States, the sample of students is slightly more male (51 percent) than female. As the fourth column of Table 1 illustrates, the data are somewhat uneven across sites. The most common variable across sites was gender, which we observed in 15 of the lotteries. Age (8 lotteries), SAT (4 lotteries), and campus living conditions (4 lotteries) are the next most common variables. Random assignment should ensure that our treatment groups are balanced and comparable. As we explained, InsideTrack randomly divided lists of students provided by the partner schools into two groups. InsideTrack had the same data we have when they did the lottery, so in many cases, the balancing occurred on just one or two student characteristics. Once the lists were divided, the schools then chose which group received coaching and which group received the control (no additional services) treatment. While one might expect some small discrepancies, we should largely observe that there are no significant differences between the control and treatment groups. As shown in Table 1, this is the case. In the sample taken as a whole, there were no significant differences between the coached group and the non-coached group on any of the observable characteristics (gender, age, SAT scores or on- or off-campus residence). Similarly, these variables were missing in comparable proportions of the coached and non-coached groups; there were no significant differences in the information available for the two groups. Because of our sample sizes, we have sufficient power to identify even small differences in the groups. Hence our failure to find differences is an affirmation of the randomization. To further demonstrate the balance of the treatment and control groups, we can also examine the balance of student characteristics by lottery. Table 2 does exactly this. In most cases, we know little about the overall sample; the lotteries differed on the number of observable characteristics recorded (ranging from one to 14). For each lottery, we tested the difference between the control and treatment groups. The effectiveness of the randomization holds when examining each lottery individually; of the 73 characteristics compared over the 17 lotteries, only one revealed a significant difference between the coached and non-coached groups at the 90 percent confidence level. Had we used a 95 percent confidence interval, we would have found no differences in any of the lotteries. Finally, Figures 1-3 graph kernel density estimates of the age distributions, SAT scores, and high school grade point averages of both the treatment and control groups. For each variable, the distributions for control and treatment groups are similar. These similarities validate the randomization making it possible to identify the effects solely through comparing coached and non-coached groups within each lottery. Partner universities also provided data on student persistence after six, twelve, eighteen, and twenty-four months. In some cases, partner institutions provided additional information on students’ degree completion. We only track persistence at the partner colleges, but given that public policies are focused on retention at the institutional level, tracking persistence at this level is important for public policies and institutional success. where y is an outcome for individual i who participated in lottery j. COACH represents whether the individual was randomized into the treatment coaching group. We also include fixed effects for the student participation in a specific lottery, and X is additional controls for variables such as gender, age, high school GPA, and school type. The outcome of interest is college persistence, measured in six month increments from the start of the treatment. Our standard errors control for heteroskedasticity. As we mentioned above, many of our variables are available for one cohort, but not another. In these cases, we include a dummy variable for each variable indicating whether it is missing or not (e.g. a variable for gender missing, a variable for age missing) while substituting either the mean (for continuous variables) or a value of zero (for binary variables) to the variable itself. In Table 3, we report our baseline results. Each column focuses on retention, as reported to InsideTrack by the colleges. We look at retention in six month increments. In Panel A, we report the baseline differences between coached and uncoached students without any controls except for the lottery fixed effects. In Panel B, we add controls for gender, age, ACT score, high school GPA, degree program, living on campus, Pell grant receipt, prior remediation experience, SAT score, and controls for missing values of covariates. The sample size changes across because of data availability from the individual schools. The baseline persistence rate after six months is 58 percent. This persistence rate is lower than that of the overall population, possibly due to the fact that many of these students are part-time students or older non-traditional students. In contrast to the uncoached persistence rate of 58 percent, the retention rate among coached students was 63 percent. The difference is significant over a 99 percent confidence interval. The relative effect is about a 9 percent increase in retention. When we control for covariates, the treatment effect is constant at about 5 percentage points. In Column 2, we examine 12 month retention. Here the persistence rates for coached and non-coached students were 48.8 percent and 43.5 percent respectively. The treatment effect does not change as we include covariates in Panel B. The estimated effect represents a 12 percent increase in college retention. The results after 6 and 12 months occur at a time when, in most cases, the treatment is still active. Coached students during this period are receiving phone calls from their coaches. Columns 3 and 4 show the results after 18 and 24 months. By this point, the coaches are no longer contacting the students. The treatment is over, yet we still find effects. After 18 months, the treatment effect was 4.3 percentage points representing a 15 percent increase in retention in this sample, and after 24 months, the treatment effect was 3.4 percentage points representing a 14 percent increase in persistence. These differences are all statistically significant over a 99 percent confidence interval. Moreover, these results do not change when we control for age, gender, ACT score, high school GPA, SAT score, on- or off-campus residence, receipt of a merit scholarship, Pell Grant awards, math and English remediation. For a subsample of students (3 lottery cohorts), we observe whether the student completed a degree within four years of the start of the treatment. InsideTrack worked with a variety of students, and degree completion could mean the completion of a certificate, an associate’s degree, or a bachelor’s degree. Across the three lottery cohorts, the average completion rate among the control group is 31 percent. The treatment effect is 4 percentage points and is statistically significant over a 90 percent confidence interval. These graduation results only strengthen our results on retention. In our analysis in Table 3, we have only included students who are were attending the university after six, 12, 18, or 24 months. Some students may have completed a degree within the first six to twelve months, and these students would not appear to be attending. Our enrollment data did not include these individuals who might have already graduated. If we were to amend our results in Table 3 by redefining persistence as being persistence at time X or eventual graduation, then the estimated effects become slightly stronger. 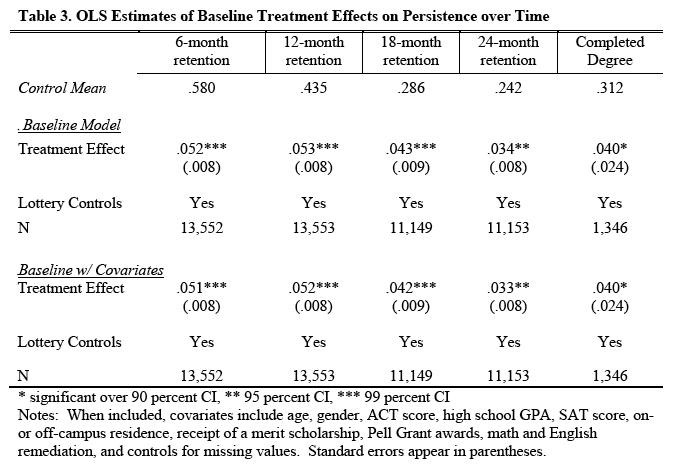 These effects on persistence (and completion) are large when compared to other interventions. 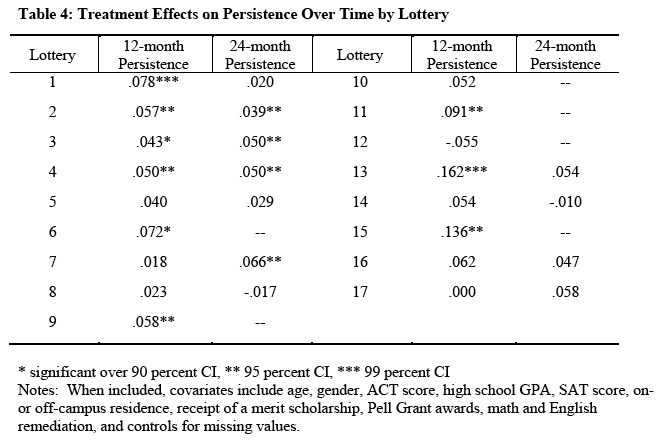 Goldrick-Rab (2011) examined a randomized experiment where students were given money for attending college without seeing any impact on persistence. Other studies of persistence find that need-based financial aid can modestly improve college persistence (e.g. Bettinger 2004, 2010). These papers find that retention rates increase by 3 percentage points per $1000 of aid. In her study of merit-based aid, Dynarski found that full tuition scholarships in Georgia led to 5-11 percentage point increases in college persistence. In the case of the Georgia scholarships, the average expenditure was roughly $2500 per year. There is no evidence that the effects disappear or persist once students are no longer eligible for aid. Over this period of time, InsideTrack charged roughly $500 per semester. The effects are stronger in InsideTrack and show persistence at least one year following the end of the treatment. The balance in the randomization and the failure of covariates to reduce the treatment effect suggest that the results are somewhat robust. One worry might be that a single lottery or single year could somehow account for the treatment effects. In Table 4, we estimate treatment effects separately for each lottery. We focus on the 12-month retention rate and the 24-month retention rate. All of the lotteries show positive treatment effects after 12 months except for two (lottery 12 and lottery 17). The positive treatment effects are somewhat uniform around the average treatment effect of 5 percentage points. Two lotteries show effects in excess of 10 percentage points. Nine of the observed effects are statistically significant within the lotteries. After 24 months, we only observe treatment effects in 11 of the 17 lotteries. Among the treatment effects after 24 months that we observe, four are positive and statistically significant with the maximum observed effect around 6.6 percentage points. Five are positive but not statistically significant with three of these five being larger in magnitude than the average treatment effect across all sites. Two are negative with the lowest observed effect at -1.7 percentage points. The lesson from Table 4 is that the treatment effects are not arising because of one specific lottery. The observed effects are quite similar across sites. Broadly speaking the results suggest that the program is having a consistent effect across sites. Another possibility is to check whether there are differences in treatment effects across years. If, for example, InsideTrack were to have different levels of effectiveness in different types of schools, we might expect some differences in treatment effects depending on whether InsideTrack’s client base is similar across years. If these differences are large enough, then one year’s impacts might explain the overall effects, but as we show in Table 5, the effects are balanced across years. Except in one case (2004 cohorts after 24 months), the treatment effects are all positive and significant for both samples across the different time horizons. 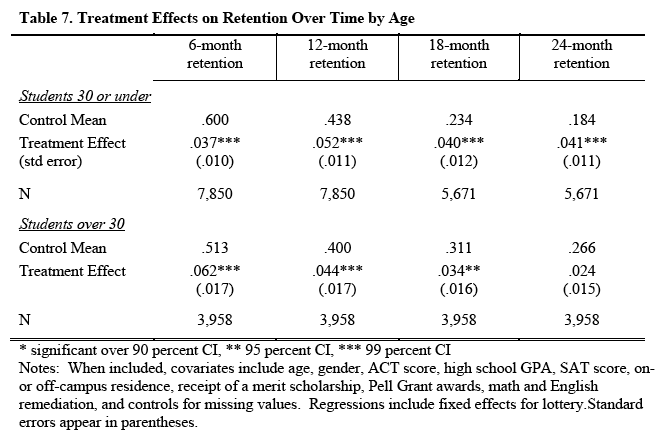 The effects appear somewhat smaller in the case of the 2007 cohort although the differences are not statistically different except in the estimates of retention after six months. The effects seem to be somewhat balanced over time suggesting that the program’s effects are not being driven by one year. In Table 6, we investigate whether the effects differ for males and females. In Panel A, we report the effects for females, and in Panel B, we report the effects for males. After six months, the treatment effects were 2.5 percentage points for females and 6.1 percentage points for males. The difference is statistically significant. After 12 months, the treatment effects are 4.5 and 5.4 percentage points for females and males respectively. After 18 months, the treatment effects are 3.3 and 4.7 percentage points for females and males respectively. The impacts of coaching are not significantly different in persistence after 12 or 18 months. The impacts after 24 months are 2.2 and 4.7 percentage points for females and males respectively. These differences are statistically significant. The difference between the non-coached and coached groups was always greater for males than for females. While males persisted at rates lower than their female peers, student coaching had larger effects for males. Two of the four differences in treatment effects were statistically significant. Male completion rates typically lag behind females and have been somewhat insensitive to interventions. There appears to be some evidence that the effect is larger for males suggesting that this student coaching could reduce gender gaps in completion. In Table 7, we examine the effects of the program for different age groups. 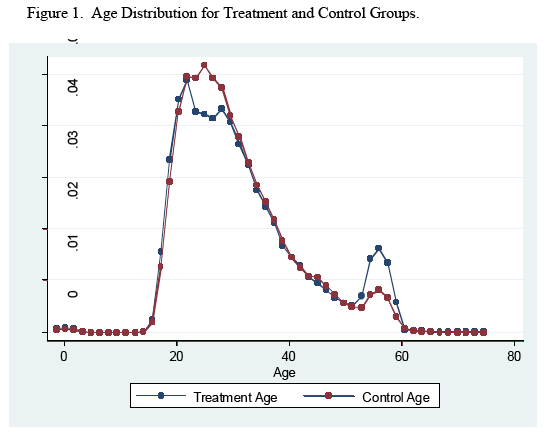 We find that the estimated treatment effects have similar magnitudes across different age groups. The treatment effects are about 3.7 percentage points for students 30 and under after six months and about 6.2 percentage points for students older than 30. The treatment effects are 5.2 and 4.4 percentage points respectively after 12 twelve months. After 18 months, the treatment effects are 4.0 and 3.4 percentage points for students 30 and under and over 30 respectively. After 24 months, the treatment effects are 4.1 and 2.4 percentage points respectively. All of the estimates are positive and only the treatment effect on older students after 24 months is statistically insignificant. Oftentimes in higher education, we assume that students know how to behave. We assume that they know how to study, how to prioritize, and how to plan. However, given what we know about rates of college persistence, this is an assumption that should be called into question. Across all sectors of higher education, more needs to be known about how to increase college persistence. Literature in economics, education, and sociology suggests that student coaching may be one way to help students succeed in college. We find exactly this. While coaching was taking place during the first year, coached students were about 5 percentage points more likely to persist in college. This represents a 9 to 12 percent increase in retention. We also find that the effect of coaching on persistence does not disappear after the treatment. Coached students were 3-4 percentage points more likely to persist after 18 months and 24 months. These represented roughly a 15 percent increase in college retention among our sample. All of these effects were statistically significant. For the three campuses for which we have degree completion data, we find that coached students had graduation rates four percentage points higher than uncoached students after four years. These results are highly supportive of the potential of student coaching. When we compared the costs and benefits of student coaching to programs that target financial aid, we find that student coaching leads to larger effects than financial aid and are much less costly to implement. The persistence of the effects after the treatment period and impact on completion only increases the cost effectiveness. The results also shed light on recent interventions which included a counseling component. For example, in the Opening Doors initiative, students were provided financial incentives and counseling. While economists have stressed the incentives as being important in the observed effects, the regular contact from a college counselor may have been the operative mechanism by which effects occurred. 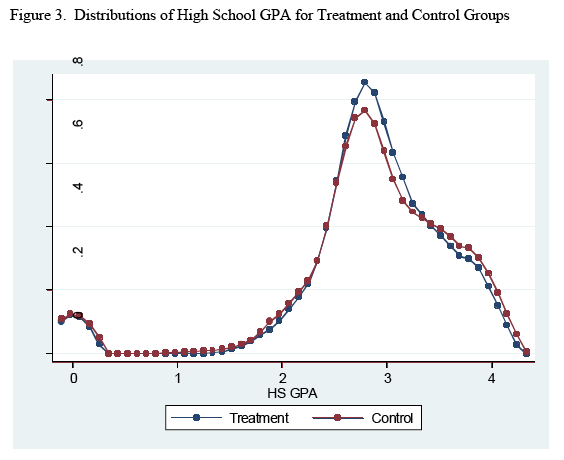 Additionally, Angrist, Oreopoulos and Lang (2006) finds that students who had access to incentives and counseling had higher academic performance in college. They, however, did not find any effect of counseling by itself. There are two key differences between InsideTrack and the intervention studied by Angrist et. al. One is that the counseling was voluntary in the treatment studied by Angrist et. al. Students had to find the counselors. In the case of InsideTrack, the coaching remains voluntary but the counselors attempt to find the students and provide both proactive and continuing outreach to the students. The outreach by counselors was also present in the Opening Doors experiment. Another key difference is that the advisers in the Angrist et al study were trained upper class students, not full-time coaches and were not supported by the process and technology infrastructure that InsideTrack utilizes. Our study is one of the first studies to use random assignment to evaluate the effects of student coaching, and additional study is warranted. Research in other educational evaluations (e.g. Dee 2004, Bettinger and Long 2004) suggests that the traits of high school and college instructors influence student outcomes. It would be interesting to know if there are specific characteristics of the college coaches which increase their efficacy. We also do not know the specific types of coaching services and the specific actions of coaches which are most effective in motivating students. Further study can also shed light on how student coaching might affect other student populations. Our study includes public, private, and proprietary institutions, and it includes a broad range of students including students who are pursuing associate’s degrees, and bachelor’s degrees. While the sample with whom InsideTrack works is more similar to the broad range of college students, we cannot observe all of the unique characteristics of students in our samples, and even if we could, we do not have enough power to identify the effects on important subgroups. We do have power to identify the effects on males and females and younger and older students. We find that the effects do not vary by age. The effects on older students and younger students are similar. While the effects are positive for both males and females, we do find some evidence that the effect is larger for males. As such, it could reduce some of the disparities in college completion that exist by gender. Adelman, C., & Gonzalez, B. (2006). The Toolbox Revisited: Paths to Degree Completion from High School Through. In Department of Education. Angrist, J., Lang, D., & Oreopoulos, P. (2009). Incentives and services for college achievement: Evidence from a randomized trial. American Economic Journal: Applied Economics, 1(1), 136–163. Bettinger, E. (2004). How financial aid affects persistence. NBER Working Paper. Bettinger, E. P., Long, B. T., Oreopoulos, P., & Sanbonmatsu, L. (2009). The Role of Simplification and Information in College Decisions: Results from the H&R Block FAFSA Experiment. NBER Working Paper No. 15361. National Bureau of Economic Research. Bloom, D., & Sommo, C. (2005). Building Learning Communities Early Results from the Opening Doors Demonstration at Kingsborough Community College. MDRC, 65. Brock, T., & Richburg-Hayes, L. (2006). Paying for Persistence. Early Results of a Louisiana Scholarship Program for Low-Income Parents Attending Community College. MDRC, 43. Calcagno, J. C., & Long, B. T. (2008). The impact of postsecondary remediation using a regression discontinuity approach: Addressing endogenous sorting and noncompliance. NBER Working Paper. Dee, T. S. (2005). A teacher like me: Does race, ethnicity, or gender matter? American Economic Review, 95(2), 158–165. Deil-Amen, R., & Rosenbaum, J. E. (2003). The social prerequisites of success: Can college structure reduce the need for social know-how? The Annals of the American Academy of Political and Social Science, 586(1), 120. Deming, D., & Dynarski, S. (2008). The lengthening of childhood. The Journal of Economic Perspectives, 22(3), 71–92. Gallagher, R. (2010). National Survey of Counseling Center Directors. American College Counseling Association. Gansemer-Topf, A. M., & Schuh, J. H. (2006). Institutional Selectivity and Institutional Expenditures: Examining Organizational Factors that Contribute to Retention and Graduation. Research in Higher Education, 47(6), 613-642. Goldrick-Rab, S. (2010). Challenges and Opportunities for Improving Community College Student Success. Review of Educational Research, 80(3), 437. Kasworm, C. E. (2008). Emotional challenges of adult learners in higher education. New Directions for Adult and Continuing Education, 2008(120), 27–34. Kasworm, C. E., & Pike, G. R. (1994). Adult undergraduate students: Evaluating the appropriateness of a traditional model of academic performance. Research in Higher Education, 35(6), 689–710. Kasworm, C. (2005). Adult Student Identity in an Intergenerational Community College Classroom. Adult Education Quarterly, 56(1), 3 -20. Kern, C. W., Fagley, N. S., & Miller, P. M. (1998). Correlates of College Retention and GPA: Learning and Study Strategies, Testwiseness, Attitudes, and ACT. Journal of College Counseling, 1(1), 26–34. Lotkowski, V. A., Robbins, S. B., & Noeth, R. J. (2004). The role of academic and non-academic factors in improving college retention. ACT Policy Report, 20–24. Obama, B. (2009, February). Address to Joint Session of Congress. Speech presented in Washington, D.C.
Robbins, S. B., Lauver, K., Le, H., Davis, D., Langley, R., & Carlstrom, A. (2004). Do psychosocial and study skill factors predict college outcomes? A meta-analysis. Psychological Bulletin, 130(2), 261–288. Scrivener, S., & Weiss, M. J. (2009). More Guidance, Better Results? New York: MDRC. Thaler, R. H., & Sunstein, C. R. (2008). Nudge: Improving decisions about health, wealth, and happiness. Yale Univ Pr. Tinto, V. (1975). Dropout from higher education: A theoretical synthesis of recent research. Review of educational research, 45(1), 89. Tinto, V. (1998). Colleges as Communities: Taking Research on Student Persistence Seriously. The Review of Higher Education, 21(2), 167-177. Turner, S. E., (2004), Going to College and Finishing College. Explaining Different Educational Outcomes, p. 13-62 in , College Choices: The Economics of Where to Go, When to Go, and How to Pay For It, National Bureau of Economic Research, Inc.
Zeidenberg, M., Jenkins, D., & Calcagno, J. C. (2007). Do Student Success Courses Actually Help Community College Students Succeed? CCRC Brief, 36.